POWER UP: "Week 22, Day 1." Supernova hovers in the air, posing outside the window of Lex Luthor's Metropolis office. Supernova was last seen recovering the Kryptonite gauntlet of Luthor's power-suit, so these two characters may have some history together. Luthor believes that Supernova is Superman, toying with him through a new masked identity. 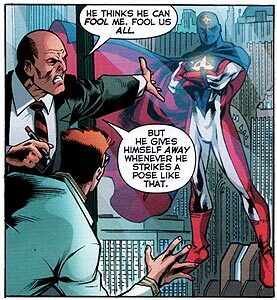 It is not clear why Supernova is spying on Lexcorp or Lex Luthor, and Luthor may be right that Supernova is toying with him. 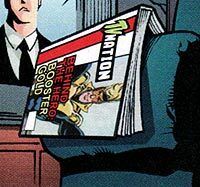 EXTRA, EXTRA: Booster Gold appears on the cover of TV Nation magazine, accompanied by the headline "Behind the Hero: Booster Gold." Presumably the DC Universe features a television series about the private lives of heroes similar to VH1's popular "Behind the Music" series. Boosterrific Review: The guessing games about Supernova's true identity continue while Doc Magnus flees persecution and Steel pursues his case against Lex Luthor. 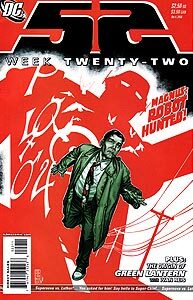 The aberration in this issue is the origin of the new Super-Chief, a character of limited relevance to the stories in 52. While the other stories are clearly continuing and advancing larger plots, the sudden appearance of this new character (hero? villain?) seems strikingly out of place and tangential to the momentum of the issue’s other events.